I personally feel Mr. Leahy is being a bit unfair to Gary Bettman. 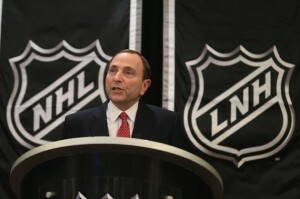 My personal view has been Mr. Bettman has acted professionally throughout the lock-out. And I also think his apology is sincere. And I am no fan of Gary Bettman. “Since the CBA news broke early Sunday morning, teams around the NHL have publicly apologized to the fans for the lockout. On Wednesday, it was Bettman’s turn to do so. As George Costanza once famously said, “You can stuff your sorries in a sack, mister”. I haven’t heard much contrition out of any of the players nor the Fehr brothers and they were as much to blame for this travesty as the Commissioners Office and the owners. It takes two to tango and both sides were trying to lead but stepping on each others feet. And the owners and Mr. Bettman were the first of the two sides to put forward a realistic proposal. So I don’t really think it is fair to soley dump on the commissioner.